Seeing signs like this sprouting alongside highways sent me into photojournalist mode. However, something about the sign's elaborate crafting brought me back for a second, closer look. 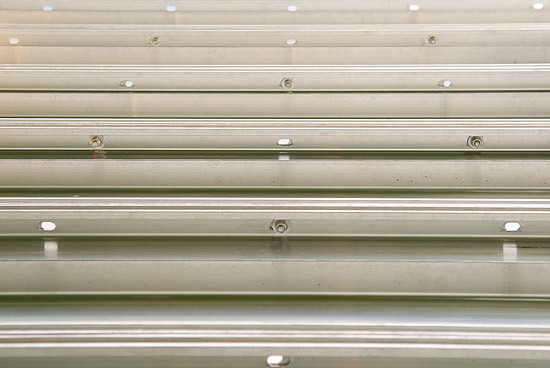 I brought a step ladder so I could shoot on level with the graphics. 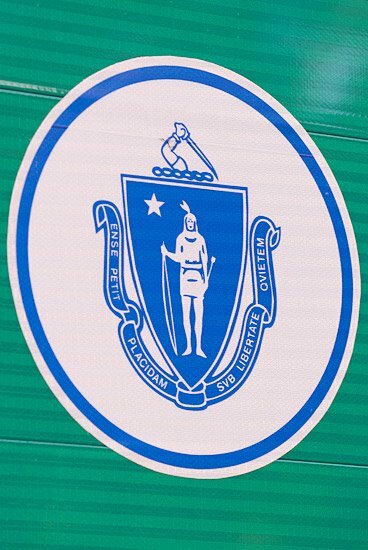 Here is the Great Seal of Massachusetts. I walked across the street and photographed this historical marker. 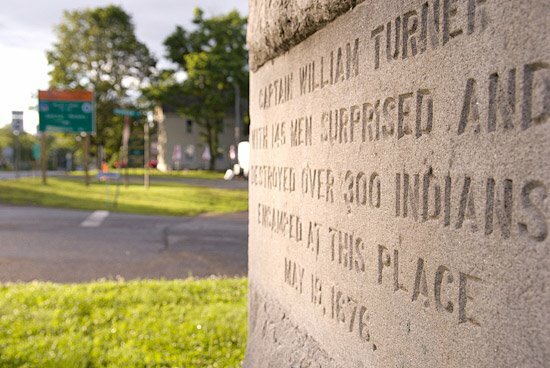 Captain William Turner with 145 men surprised and destroyed over 300 Indians encamped at this place. May 19, 1676 The event took place before Massachusetts - named for Native Americans living in the region - became a state. Back to the sign. 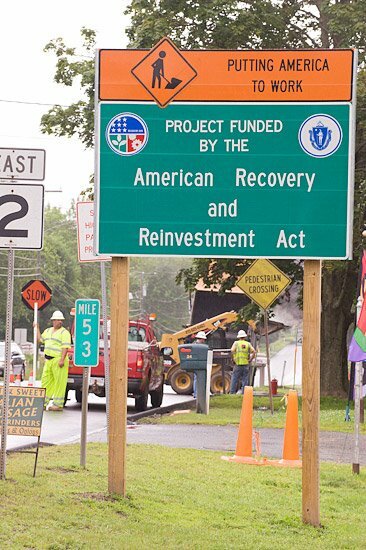 Contemplating this logo, I began thinking about how it's not just the road workers in my original caption that benefit from economic stimulus highway money. What about graphic designers, manufacturers of the these decals, sign component manufacturers and the lumber yards? I realized the sign's grand design and construction intentionally distributes money across a range of occupations. 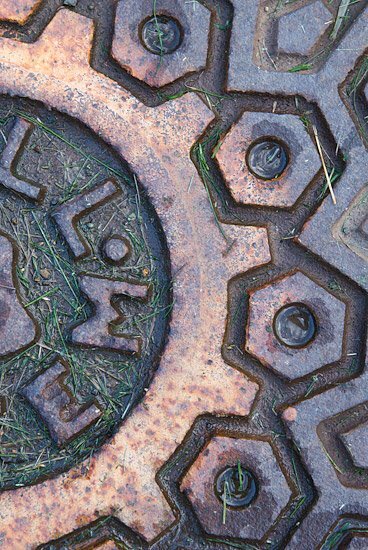 Poking around across the highway, I came across this Bell System manhole cover. 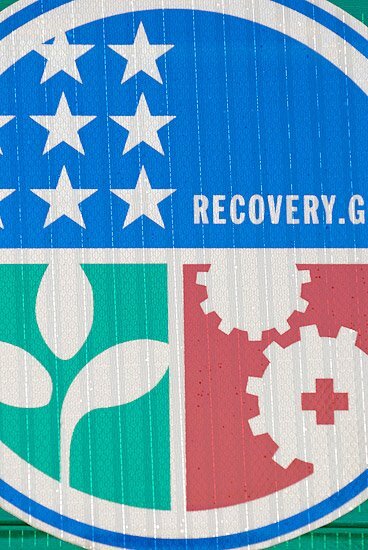 I was staggered by how the gear-like pattern so resembled that of the recovery.gov logo. 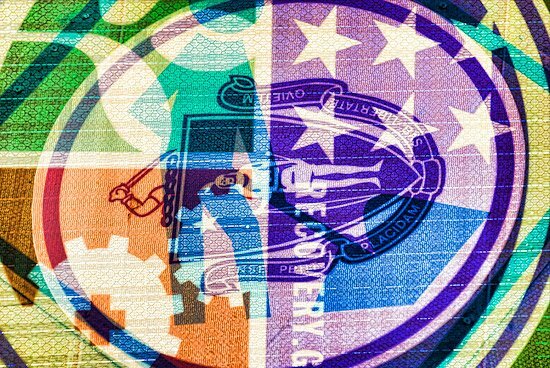 I was excited how this multiple exposure came out, as it embodies the overlapping intricacies of history and economics.